Two specific features of note in the Mitsubishi Mirage are the embedded Bluetooth wireless connectivity, and a smart touchscreen centered on the dashboard. The Bluetooth system installed in the Mirage makes it possible for you to connect your phone or other Bluetooth-enabled audio device to your vehicle, so that you can enjoy your tunes on the go. The smart touchscreen in the dashboard makes it simple and easy for both driver and passenger to access many of the features of the Mirage with a few simple finger taps. 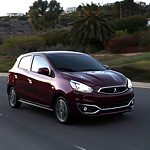 Does the Mitsubishi Mirage sound like the kind of vehicle that you want to drive? If so, then we welcome you to visit our dealership in Marietta, and our friendly staff will gladly set you up with a test drive.